Garry Kasparov Arrested at Russian Rally! 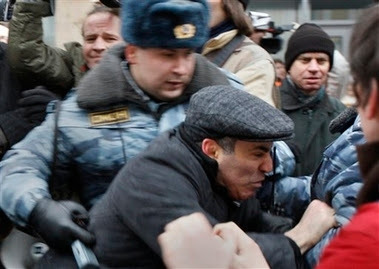 Garry Kasparov seized by police at a rally in Moscow! Kasparov was forced to the ground and beaten, his assistant Marina Litvinovich said in a telephone interview from outside the police station where he was being held- CNN. Garry Kasparov was later charged with resisting arrest. Former chess champion and opposition leader Garry Kasparov was arrested in Russia today. Russian police have detained opposition leader and former world chess champion Garry Kasparov. He and other critics of President Vladimir Putin were arrested as police broke up a rally in Moscow organised by Mr Kasparov’s Other Russia coalition. 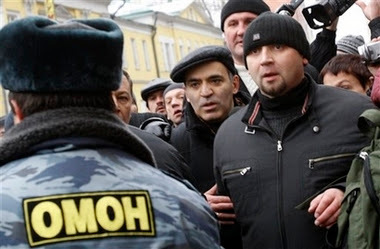 Police moved in when protesters tried to march to the election commission, which had barred Other Russia candidates from next week’s election. President Putin’s supporters are widely expected to win the 2 December poll. Other Russia brings together a broad coalition of mainstream politicians, leftists and nationalists, all of whom are opposed to the Kremlin. On Friday, Russian secret police raided Kasparov’s office and wrote down the passport numbers of all of his staff members. 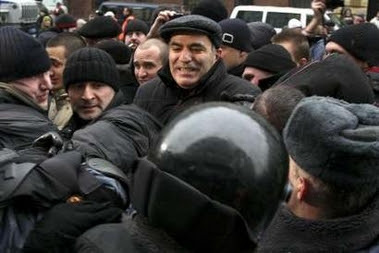 RIA Novosti reported on Kasparov’s arrest after police originally denied that the opposition leader had been detained. UPDATE: The New York Times has more on Kasparav’s arrest, via Instapundit.